On August 29, Bryan Fuller’s gory, critically-beloved Hannibal, adapted from the novels of Thomas Harris, left the airwaves, after being booted by NBC three innovative yet little-watched seasons in. Proponents of the gruesome series—and they are legion—are left to wonder what went wrong. Maybe the show was too violent or too avant-garde for mainstream audiences. Maybe viewers were weary of erudite serial killer Hannibal Lecter, whose exploits had already been captured in four novels and (somehow) five movies over the course of three decades. Certainly, some amount of franchise fatigue kicked in between 1991’s Oscar-winning The Silence Of The Lambs, arguably Lecter’s pop cultural zenith, and 2007’s decidedly-not-Oscar-winning Hannibal Rising. All of these problems may have played a role in Hannibal’s untimely demise and prevented Fuller from fully realizing his ambitious, multi-season story arc. Or maybe it was something much simpler: the theme song. Although Brian Reitzell’s music for Hannibal garnered a nomination for Best New Theme Song In A Series at the 2013 Online & Television Association Awards, his main title simply lacked the audience-pleasing punch of “I’ll Be There For You” by The Rembrandts, which served as the peppy theme tune for NBC’s much more popular Friends from 1994 to 2004. 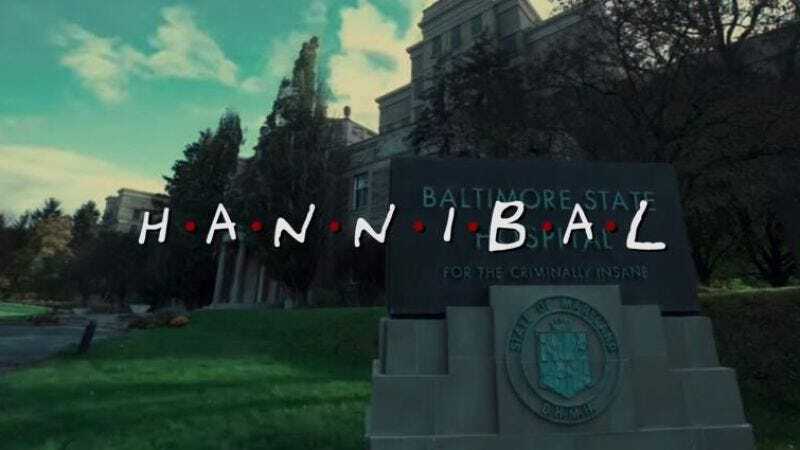 YouTuber Andrew Kuhar has corrected this oversight with a mashup video entitled “Friends For Dinner,” which gives Hannibal the kind of cheery, high energy, Bright/Kauffman/Crane intro that would have (presumably) kept viewers tuning in for season after season of cannibalism and dismemberment. With The Rembrandts chirping away on the soundtrack, the NBC viewing audience might not have been so put off by James Hawkinson’s sumptuously gloomy cinematography or even the fact that a man had been set on fire. Meanwhile, series star Mads Mikkelsen’s droll observation that “it’s nice to have an old friend for dinner” shows that Hannibal could also have benefited from a laugh track. Get working on this, YouTube.